What is Quarter Midget Racing? 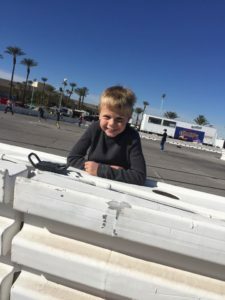 JR Animal…went from the heat to the C main and was edged out from advancing when the car Aidan was trying to pass lost a part and got in his line of sight. JR Honda…went from the heat to the D main and didn’t advance. JR Stock…went the A main and was in the mix with 4 to go when a spinning car clipped Aidan and broke the steering rods. He was unable to finish. We learned a lot…made some mistakes, had some personal victories and will be better next time out! This was Aidan’s first race of this size. The track and cool conditions were new to him. This was the first race where he drove more than one car (he managed 3 this weekend!) It’s pretty easy to get overstimulated in this kind of environment. Daddy set up and managed 3 cars and they were competitive! Thanks to those who helped us learn and make great stuff for us to work with. We had to have some tough skin and keep our heads up after the JR Stock heat race on Friday. To those who have been kind and supportive to our team, and especially my little guy, you are very much appreciated. Teaching youngsters about competitive sports is tricky and the fact that it’s driving…well that’s a whole other monkey wrench! and special thanks to the Rankin family of Lil’ King Racing! 4th place finish Jr Honda heat! 5th finish in the Jr Animal heat. 3 nationally ranked drivers ahead of him but that’s the luck of the draw…great driving!